When I’m not doing homework or taking apart clocks or sleeping or working on an iPhone app (that one’s new!) I can almost always be found at my home away from home, The Able Baker, where I am a barista and key-holder. 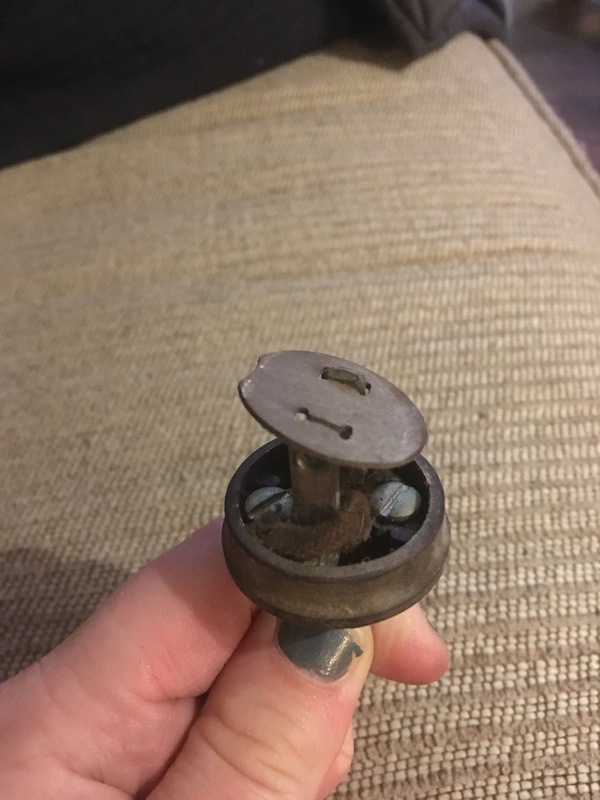 It’s there that I met Lori, who asked me to take a peek at what she described as “an old clock sitting in my closet.” I totally get how that could happen – someone hands it down, it doesn’t get serviced, next thing you know it’s been in the attic for 20 years. The clock is a No. 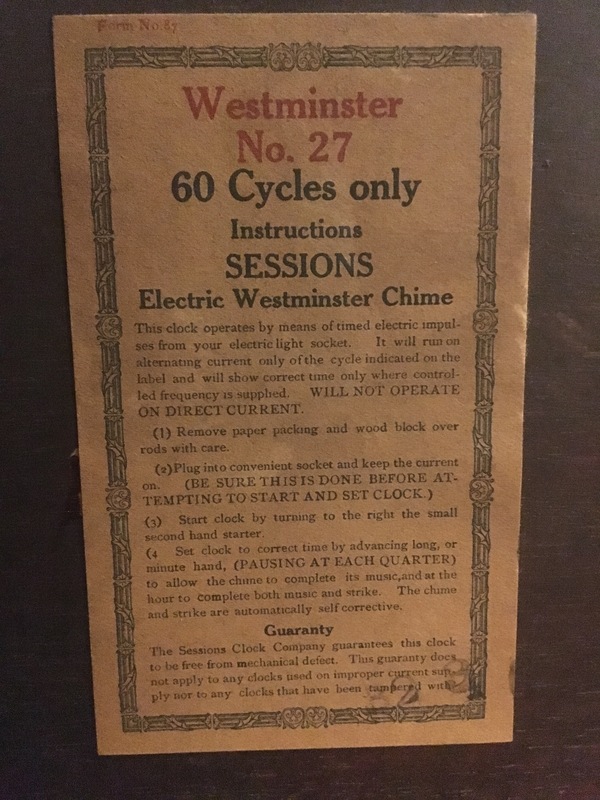 27 Westminster Chime Sessions Electric clock. I bet it’s been more than 20 years since this clock has been serviced, though the movement itself looked alright. The catch? It’s electric. Cue the music! you say. Electric means easier, right? 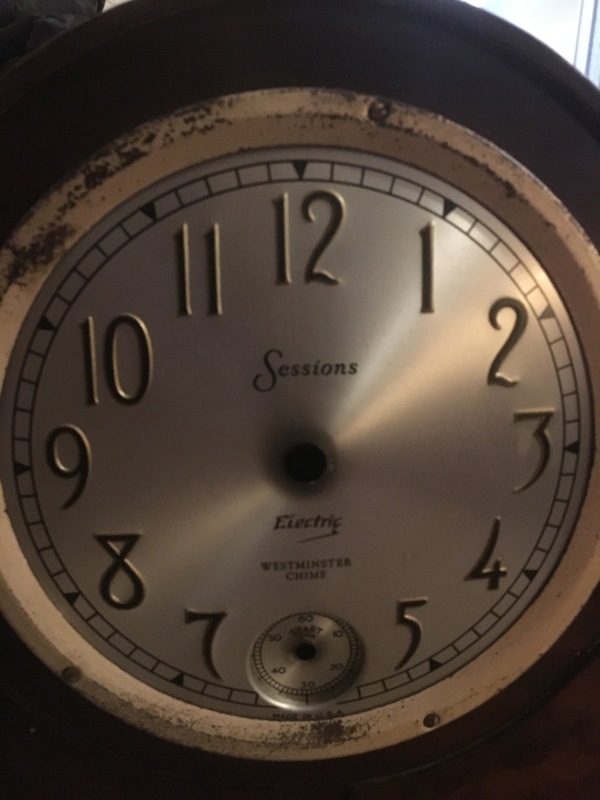 Well… not if its from 1932 as I think this clock is. 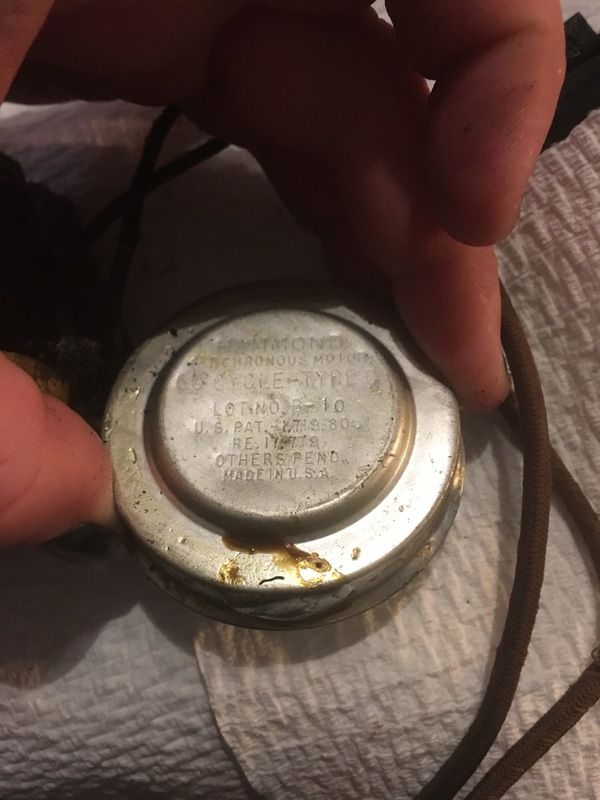 With a warning to “use only at 60 Hz” this clock’s electrical components have long outlived their lifetime. 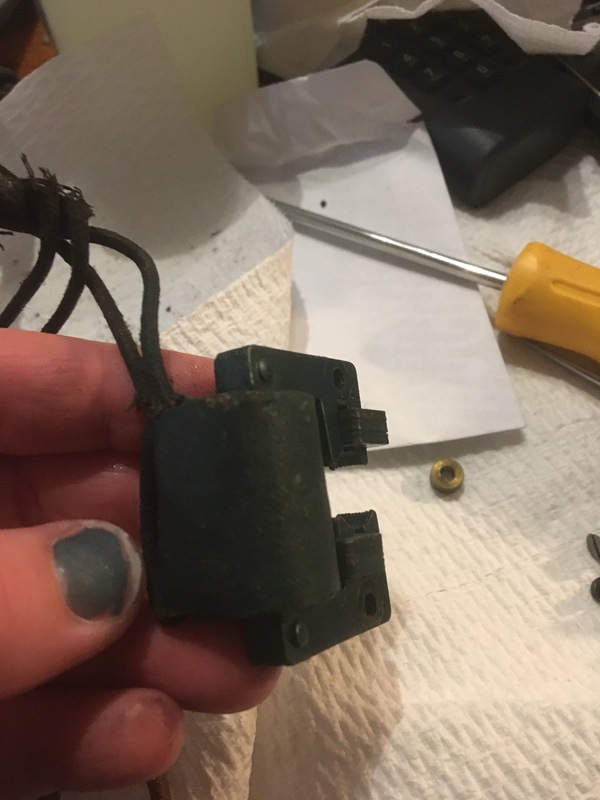 I opened it up expecting to need to replace the electrical cord and nothing else. It’s not something I’ve done before, but hey, I’m an engineer! I am totally up for a challenge. 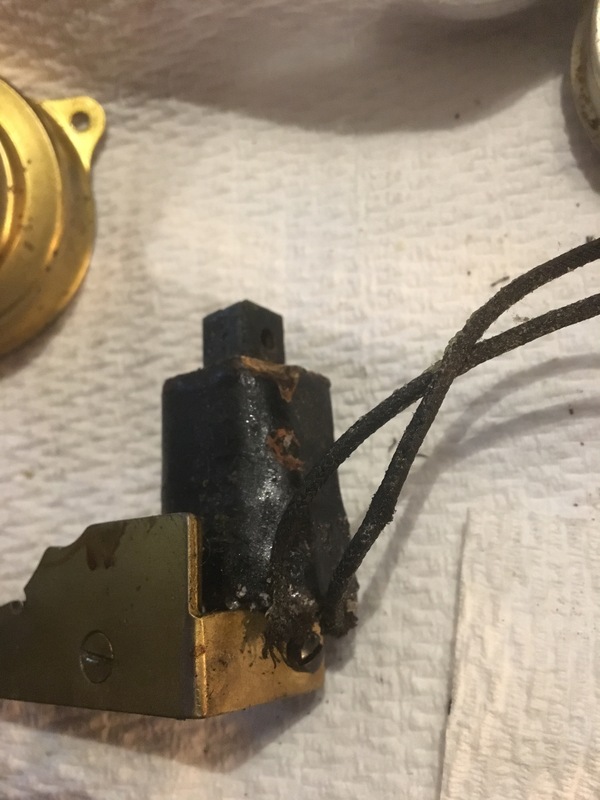 Unfortunately the two motors inside the clock were basically screaming “I’m an electrical fire waiting to happen!” They both operate at a full 120 Volts and 60 Hz straight from the outlet, and the time of the clock is actually maintained by those 60 Hz. 60 Hz, for those who don’t recall, means 60 rotations per second, which for a clock maker is easy to convert with planetary gears to be 60 rotations per minute aka seconds. So to fix this clock I’ll need two new 60 Hz AC synchronous motors, and some way to power them. Because 60 Hz is fairly insignificant, I’m thinking of just rigging up a battery pack and putting it in the back of the clock case. It would probably be easier than rewiring the clock and making sure that it can handle 120 V plus power surges. I’m in the middle of finals now (grad school… ugh) but as soon as I get the time (Wednesday hopefully?) I’ll be exploring for a nearby electrical hobby shop. Radio Shack doesn’t cut it anymore, and other hobby shops don’t carry enough electrical parts to do me any good. I can count on Radio Shack for a partially labeled motor, but I won’t know its rpm by looking at it. I may stop by there for a battery pack – I know they have a few types of those. Before RS though, I will be hitting up a few stores within a 30 minute radius to see if I can find a good go-to hobby store to satisfy my soldering and motoring needs. Aww lovely post ! What a treat to read over morning coffee at Olivia’s shop on the way to church. Margaret, My knowledge of electric power engineering goes back over 60 years. Professor “Windy” Powell used to say “You guys think you so smart going into electronic engineering, but you will be back in power engineering.” He had worked on the latter part of the design of the New York subway system. But then he still favored DC power over AC power, disregarding the fact that power transmission losses go down with higher voltages and that DC did not convert to & from high voltage so easily. Students said that the reason he taught DC circuits rather than AC circuits was because he did not understand AC. The professors of that era were rather sexist towards the rare young women students; I only me 2 of them out of t he dozens of young men. At that time power stations could not dependablly maintain exactly 60 Hertz. So they just averaged the frequency over time. You might consider model train engines of the clock’s era, though I don’t know whether they were synchronous or not. Thanks, looking at model trains for motors is a great idea! I wonder how accurate these early electric clocks would have been, since the 60 Hz seems so unreliable! Hopefully I can find a motor that is reliably 60Hz.